It always pays to have a Plan B. I said to The Chef when we woke, that I didn't see the point in hanging around in the Puerto del la Duquesa area, because we had seen it so often in the past, and nice as it was to see it again, we've no reason to stay, we'd just be killing time. I suggested we made for La Linea this morning, with a view to taking a chance, Easter or not, and make for Cadiz on Good Friday. There's a large car park holding fifty motorhomes, costing €6 a night in El Puerto de Santa Maria, from where we can catch a catamaran across to Cadiz. So that was it. Scrubbed and fed we prepared the vehicle for going much further than the waste piece of land just up the road in the village next door. I took a whole tank of fresh water with us, because if it all went wrong for us at La Linea, I would have to move on, probably dossing on the public land on the beach near Tarifa with all the windsurfers. Fortunately the journey went fine and we arrived here at the marina complex in La Linea, just inside the Spanish border with Gibraltar. Setting up was quite straightforward, we nosed the vehicle in to our parking space to keep the wind off the 'front door'. We are not allowed to use such luxuries as chairs outside as that constitutes camping rather than parking, still at €12 a night we can't complain. After lunch we took my backpack and a few shopping bags folded up inside it and set off with the intension of visiting Morrisons supermarket on Gibraltar. We'd been there before, but I had it in my mind that it was just across the border, but no. Getting through Border Control was straightforward enough, before then crossing the very wide runway owned and controlled by the British military, it does have a few civilian flights in and out each day. If an aircraft is due to take off or land, barriers come down across the road and footpaths, and public access across the runway is forbidden. Once in town we managed to find the bus station, as we remembered having to get a bus there last time. The number 8 finally arrived and on we got. Two return tickets for a total of £4.50. The bus journey length - four minutes, I timed it on my watch on the return journey. 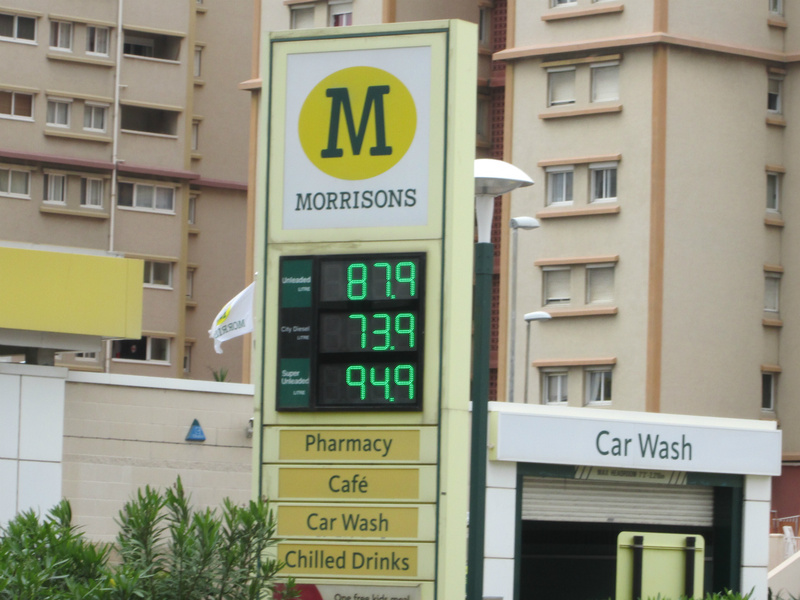 Needless to say if we want to go to Morrisons again we'll find our way there on foot. We didn't buy a huge amount, but nevertheless it came to just over £40. My word, you don't get much for your money in there, the only advantage being you are buying familiar brands. Still supermarkets work on a narrow profit margin as a norm, so somebody has to pay the additional shipping and transport costs to get goods delivered from the UK. Our evening meal was Southern Fried Chicken and potato wedges bought hot from Morrisons, then just heated up in a dry frying pan when we got back. Two hot meals for £3.15, add the price of a couple of nice cool beers and a crusty baguette, and that's not bad value, and it made The Chef's life easier as we have limited facilities parked up at places like this. Tomorrow we shall play tourists, and have a wander around town, and maybe a closer look at The Rock than we did last time.